Results of the Infant Aphakia Treatment Study (IATS) show contact lenses are better long term than implanted lenses. Here an infant is shown wearing a rigid gas permeable contact lens in the right eye to focus the eye after cataract surgery. The normal left eye is wearing a patch to strengthen the vision in the right eye. Photo credit: Buddy Russell, Emory Eye Center. A five-year nationwide study based at Emory Eye Center has reported new findings for babies who have undergone cataract surgery. The clinical trial suggests that for most infants who have had cataract surgery, the use of contact lenses for several years—and an eventual lens implant—may be the better solution than the standard of care, the intraocular lens implant following surgery. For adults and children who undergo cataract surgery, implantation of an intraocular lens (IOL) has been the standard of care. The Infant Aphakia Treatment Study (IATS) found that for babies, use of a contact lens initially was preferred. The trial was funded in part by the National Eye Institute (NEI), a component of the National Institutes of Health. Emory Eye Center was one of 12 sites across the country and was the lead center for this national study with a team of 10 professionals at Emory alone. A cataract is a clouding of the eye’s natural lens and can be removed through a safe, quick surgical procedure. After cataract removal, most adults and children receive a permanent artificial lens, called an intraocular lens (IOL). This is an option for infants, too, but the trial found that the use of contact lenses is safer than, and just as effective as, an IOL for infants under 7 months old. The most recent data from the trial were published today in JAMA Ophthalmology. manage it, contact lenses are the better option until the child gets older," said Scott Lambert, MD, the study’s lead investigator and the R. Howard Dobbs Professor of Ophthalmology at Emory University in Atlanta. "The IATS is a landmark study in the refractive management of infants with cataracts," says Timothy W. Olsen, chairman of the department of ophthalmology at Emory University. "Attempting to estimate the life-long lens implant power and also place an adult lens in a growing infant’s eye is challenging. Families and physicians may now comfortably choose to use contact lenses and wait until children are older when the eye is more mature. The strong evidence, generated by the dedicated investigators in the IATS, helps provide a solid basis for this choice." Although cataracts are often tied to aging, it’s estimated that 1,200–1,600 infants are diagnosed with congenital cataracts (present from birth) each year in the United States. The condition can affect both eyes, but it often affects just one, which is called unilateral cataract. The new study compared the use of IOLs versus the use of contact lenses during infancy for treating congenital, unilateral cataract. In the United States, most children with cataract will eventually receive an IOL, but the timing varies, Dr. Lambert said. "I’ve had patients wait until they were in college, whereas others will have it done when they are 5 or 6 years old," he said. Still, some prior research suggested that using an IOL to treat cataract during infancy can improve long-term visual outcomes, he said. IOLs can also spare babies—and their parents—the discomfort of daily contact lens changes, and reduce the risk of introducing germs into the eye. On the other hand, the use of IOLs during infancy also has some drawbacks. Surgeons have difficulty judging the right focusing power of the artificial lens for an infant, because it’s a time of rapid eye growth. Also, while IOL implants are typically safe and complication-free for adults, they are more likely to cause post-operative problems for infants. "Cataract surgery and the use of IOLs for infants have become more sophisticated and more widely practiced over time. In this study, the goal was to determine if the beneficial effects of IOLs outweigh their known complications," said Donald Everett, MA, who is NEI’s director of collaborative clinical research. Lambert, SR et al. for the Infant Aphakia Treatment Study Group. "A Comparison of contact lens and intraocular correction for monocular aphakia during infancy: a randomized clinical trial of HOTV optotype acuity at age 4.5 years and clinical findings at age 5 years." JAMA Ophthalmology, March 2014. The Infant Aphakia Treatment Study began in 2004. (Aphakia refers to an eye without a lens.) The study involved 12 clinical centers, and enrolled infants with a cataract in one eye. Parents visiting these clinics were informed about the study, and about the potential benefits and risks of cataract surgery with and without an IOL. The study ultimately enrolled 114 infants who were between one to six months old at the time of surgery. 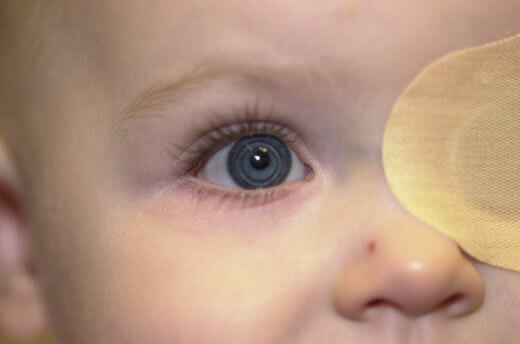 By random assignment, about half of the infants received an IOL and the other half received contact lenses. The lenses were soft silicon or hard gas-permeable plastic, and specially designed to fit small eyes. The children in the study are now toddlers, and the investigators have examined visual acuity and other outcomes over the long term in both treatment groups. Of note, visual acuity testing in studies like this one presents unique challenges. An adult visual acuity test involves that familiar eye chart with rows of progressively smaller letters—and isn’t feasible for a child who hasn’t learned the alphabet. The 1-year-olds in the study were tested with Teller acuity cards, which are flash cards imprinted with finer and finer grating patterns—the idea being that a visible pattern will grab a baby’s attention while a card that looks blank will not. At 4 ½ years old, the children were evaluated with the HOTV test, which requires kids to read the letters H-O-T-V or match flash cards containing one of the letters to a response card in their hands. There were no significant differences in visual acuity between the two groups at age1, or at age 4 ½ years. However, there were more post-surgical complications in the IOL group, which in turn led to more corrective surgeries. The most frequent complication was lens reproliferation—which is when lens cells left behind after cataract surgery migrate into the pupil and interfere with vision. By age 5, lens reproliferation was 10 times more common with IOLs, occurring in 23 (40 percent) of infants in that group, compared to only two (4 percent) in the contact lens group. This complication and others led to the need for one or more additional eye surgeries among 41 (72 percent) of the infants in the IOL group, and 12 (21 percent) in the contact lens group. By age 5, nine children in the contact lens group developed minor eye infections that cleared up with antibiotic drops, and in one child, a contact lens broke during wear. None of these issues had permanent effects on vision. Three infants in the contact lens group had IOLs implanted before age five, because their families had difficulty with day-to-day contact lens changing and maintenance. "We think that for most infants with unilateral cataract, contact lenses are the better option than an IOL," Dr. Lambert said. "However, in some cases, the parents and their physician may decide that contact lens wear proves to be too challenging, and ultimately not in the child’s best interests." Aside from potential discomfort for the child and anxiety for the parents, there may be less obvious challenges to wearing contact lenses in infancy. Congenital cataract is sometimes hereditary, which means that some parents may have vision problems of their own that would make it difficult to change their kids’ contacts. Affordability could also be a challenge for some families. Although health insurance plans generally pay for an IOL, most plans do not pay for contact lenses. "I am thankful for the considerable talent and hard work of our Emory team and its efforts to bring this study to completion," says Lambert. "The study was a combined effort of pediatric ophthalmologists throughout the United States and biostatisticians and epidemiologists at the Data Coordinating Center, based at Emory’s Rollins School of Public Health." The study was funded by NEI through grants EY013272, EY013287, and EY006360, and by Research to Prevent Blindness. For more information about the study, see NCT00212134 at http://clinicaltrials.gov. For more information about cataract, see http://www.nei.nih.gov/health/cataract/.